When I saw this recipe on Fitsugar, I thought it sounded pretty interesting, but what with our new resolution to shape up and tone up I knew I had to give it a go. It promises to be low in fat and low GI but still high on taste (no mean feat...) and it really delivers on that! As an added bonus it's also a great end-0f-the-month-money-is-low type of meal and for this I love it even more. I served mine with a dollop of salsa, a sprinkle of coriander and some sliced avo and cucumber salad on the side, which really complemented the meal quite nicely. This got the thumbs-up from TheHusband as well, who is normally a bit suspicious of my vegetarian fodder. He is a big meatlover (especially chicken) and lives in fear that I'll convert back to vegetarianism and doom him to the same "fate"! 2. Place sweet potato in a microwaveable bowl and microwave on high for 8 minutes until soft. Mash and add salt to taste. 3. Meanwhile, heat the olive oil in a frying pan and gently saute the onion and garlic for a few minutes, until soft. Add to food processor with half the kidney beans and water, and process to a smooth puree. Mash the rest of the kidney beans with a fork and return to the frying pan together with the bean puree. Add spices and cook for another 2 - 3 minutes until fragrant. Add salt to taste. 4. Smear a little bit of sweet chilli sauce on a tortilla, top with a spoonful of beans as well as a spoonful of sweet potatoes. Add some grated cheese on top and fold tortilla up like a burrito. Place in a ovenproof dish and repeat with the rest of the tortillas. 5. 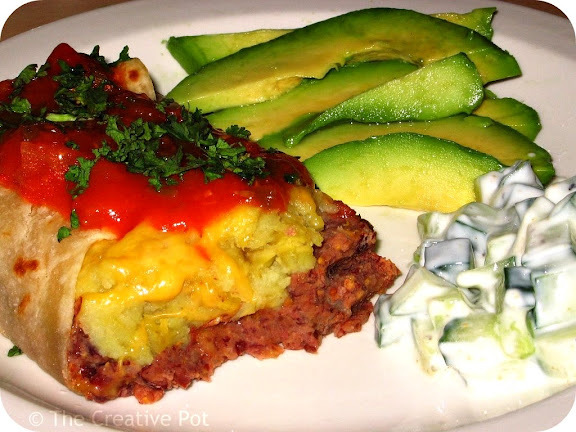 Bake for 10 - 15 minutes and serve with tomato salsa spooned on to the burritos and some sliced avocado on the side. Wow--who would have thought--sweet potatos in a burrito! I live in the desert Southwest on the border of Mexico, so I am for sure going to have to try this! I was a vegetarian once, too. I still don't eat beef or pork, but I do eat chicken and turkey. My family is the same way-if I go a few days without cooking any meat I am in trouble! I was also quite surprised at the sweet potato in a burrito, but it's really good! Give it a go. Oh MAN that looks delicious! I'm going to have to print that out! Thanks Caitirin - glad you like it! we LOVE sweet potatoes!! and we love burritos.. we HAVE to try this!!! Thanks Angelina & SillyCat - burritos are so versatile, aren't they?